Its model number and name are #211 / Masahiro Arashi. Character Bio - A Yakuza thug, Masahiro Arashi would leave behind a calling card with each murder he committed: a coin engraved with the Japanese Kanji meaning death. He murdered the family of Ana Ishikawa when she was only a young girl, setting her on the path to becoming the warrior Shi. Q - If Masahiro chooses a figure for Ruthless Command, but he is destroyed before the end of the round, do I still have to sacrifice one of my own figures if the chosen figure is still in play? A - No. Unless otherwise stated, all power effects stop working once all the figures on that card are destroyed. As soon as Masahiro is destroyed, his allies no longer receive the Attack die, but do not have to be destroyed at the end of the round. As a Human, Masahiro Arashi has these Human Synergies. Masahiro Arashi may activate a Yakuza, Ninja, or Assassin Hero or Squad with his Yakuza Oyabun special power. Current Yakuza include Masahiro Arashi. Current Ninja and Assassins. Masahiro Arashi may boost the attack of a Yakuza, Ninja, or Assassin Hero with his Ruthless Command special power. Current Yakuza include Masahiro Arashi. Current Ninja and Assassins. Last edited by Ronin; November 8th, 2017 at 09:15 PM. 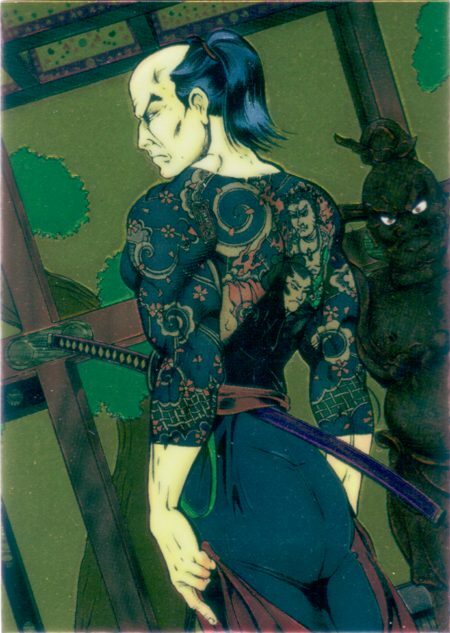 After revealing an Order Marker on this card, before taking a turn with Masahiro Arashi, you may choose any one Yakuza, Ninja, or Assassin Hero or squad you control and first take a turn with the chosen Hero or squad. At the start of each round, if there is at least one Order Marker on this card, you may choose an opponent's Unique Hero. For this round, all other Yakuza, Assassin, and Ninja Heroes you control add 1 to their Attack numbers when attacking the chosen Hero with a normal attack. At the end of the round, if the chosen Hero is not destroyed, you must destroy one other Yakuza, Assassin, or Ninja Hero you control. When rolling defense dice against a normal attack from an adjacent attacking figure, if Masahiro Arashi is not destroyed by this attack, all skulls rolled count as unblockable hits on the attacking figure. After revealing an Order Marker on this card, before taking a turn with Masahiro Arashi, you may first take a turn with any one Yakuza, Ninja, or Assassin hero or squad you control. If Masahiro Arashi destroys an opponent's figure, for the rest of the round, add 1 to his attack and defense. Last edited by A3n; April 22nd, 2015 at 07:40 PM. I'm pretty flexible on this design, especially with that last two powers. He's basically head of the Yakuza, and I have a squad of Yakuza planned, plus he hired Tomoe's band of assassins, so I want him to work with all of them, hence his first power. Might be a while before I get to an initial, busy summer so far, so lots of time to hash it out. Mixed opinion on "Yakuza" as a class in general - I don't think there's much difference between a Japanese organized criminal and an American one. I don't see why this guy wouldn't interact with Kingpin, so to speak. Powers overall look fine from what little I know of the character. What they do is similar, but they would never interact with one another. The Yakuza are very family-oriented (Kind of like the Mafia), much more closely-knit than Kingpin who works with anyone and everyone. Plus I don't really want more Criminal synergies, much rather have a little niche that works with Assassins and such than Criminals. I definitely see the logic and agree with avoiding more strands in the Criminal web. I don't mind Yakuza as a one-off class, for him, but as a new class with synergy I'm not as much a fan. Maybe go with "Enforcer" rather then Yakuza there? So far we only have Firebrand (who wouldn't hurt for some synergy) and the LexCorp Security (who would work better with Order Markers on their card). And the Yakuza Enforcer would make sense as an Enforcer as well. I suspect his points are a little low (I see him keeping pace with Batman (I) as written up, especially taking the bonding into account). No idea on the theme. The mechanics all seem clear enough. You'll have to make sure none of that bonding is too fierce as that's potentially an eclectic group of partners for him. I got no issues with it, generally but I think 5/5 attack/defense might be a little high. Otherwise looks good to me. I like both choices for the personality & might lean a little more to Passionate. How powerful is this guy? Is he just a normal human? If so, 6/1/5/5 stats seem high, especially with the chance to get to 6 Attack and Defense pretty easily if he's facing squads or weak heroes. Powers look good otherwise, though I agree with johnny in that I'd prefer not to go with 'Yakuza' if it's only going to be used for one or two figures. How about Ruthless Counterstrike (and a drop of 1 defense) in place of vanilla Counterstrike? Given that the Yakuza are pretty ruthless (even tO their own if they fail), it would be kind of neat to have them in the same vein as Samurai but more vicious. I was wondering the same thing, he's just a normal human right? As written, I'm reading that Battle Focus would stack and would also trigger if a figure is destroyed by him via Counter Strike. Last edited by SirGalahad; June 18th, 2014 at 03:07 PM.